Pah ziah refers in Chinese to the art of medicinal herbal preparations, while lou indicates a broth or a stew; placed together, the word phalo describes a broth made from an assortment of medicinal herbs. 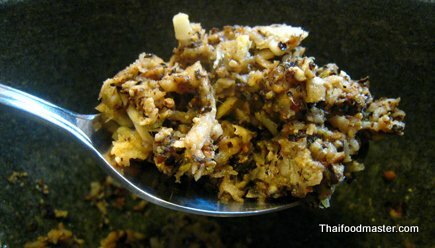 Phalo-style dishes are usually made from duck or goose, pork, chicken or eggs, and are highly praised by Chinese and Thais alike. The legendary Chinese five-spice mix, an all-purpose preparation believed to strengthen and stimulate the body, is in the heart and soul of this heavenly scented dish. 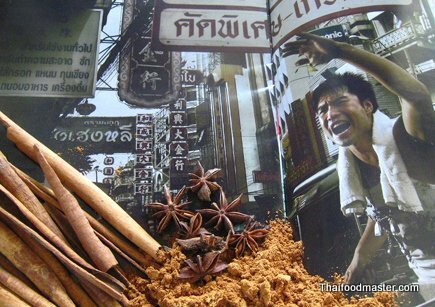 Acquire a small bottle of the five-spice mix. 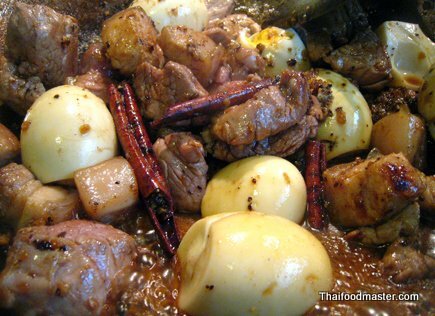 While you may not use it very often, it is definitely worth trying this stew for an exotic change. 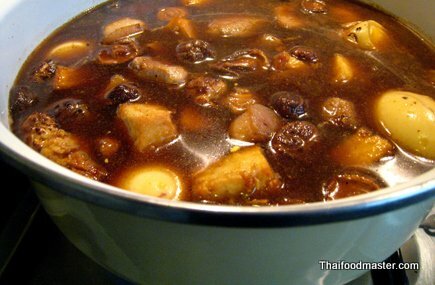 An all-time classic and a favorite Thai stew, this easy-to-prepare, tasty and fragrant dish was introduced into Thai cuisine by Chinese immigrants. 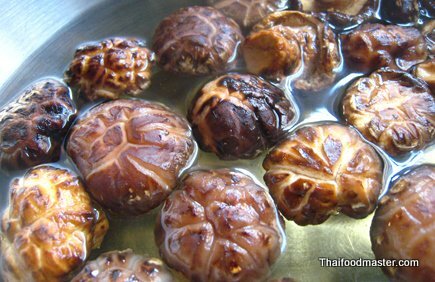 Soak the shiitake mushrooms in 1 cup of boiling water for about 15 minutes. When rehydrated, strain. Save both the water and the mushrooms, and set aside. Remove and discard the hard stalks. Gently place the eggs in a pot and cover with cold water. Add 1 tablespoon of salt and 1 tablespoon of white vinegar to prevent the eggs from cracking. Bring to boil, and let it boil for one minute on medium heat. Then turn off the heat and cover the pot. Let rest for 15 minutes. 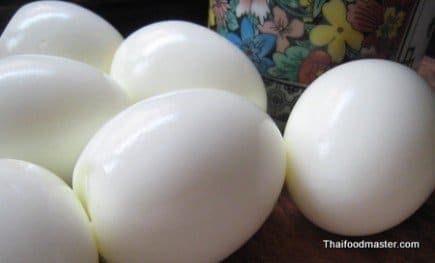 Transfer the eggs to a cold water bath, and let them cool down. Peel and dry. Set aside. 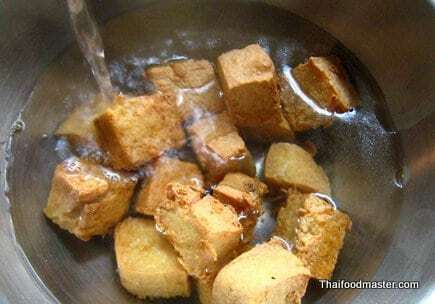 Deep fry the bean curd on medium-low heat until the cubes are golden. 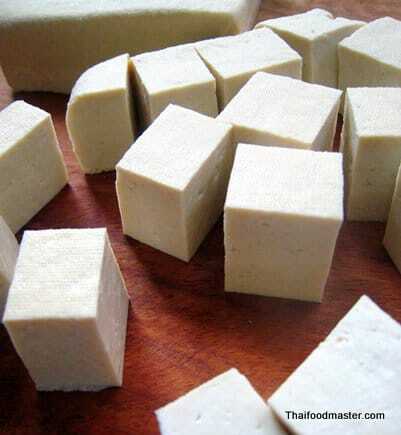 Remove the bean curd from the oil. 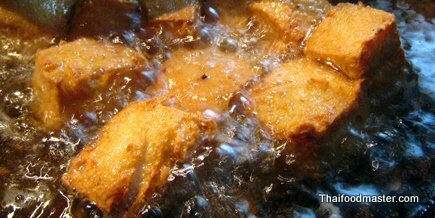 Soak the cubes in 1 cup of boiling water for about 15 minutes, then strain and set aside. 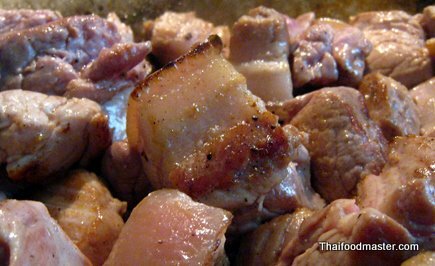 Thoroughly clean the skin side of the pork belly, and cut into 3cm (1.5") cubes. 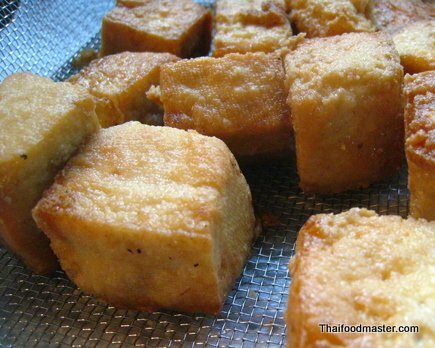 Cut the pork tenderloin into cubes of the same size. 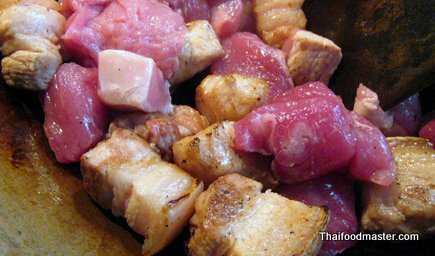 In a hot wok, without oil, roast the pork belly pieces. The heat will render out the fat. 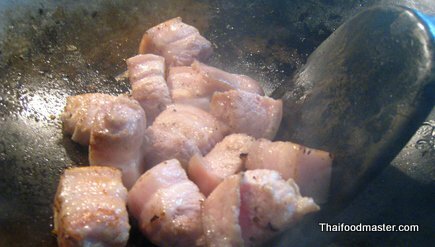 When the pork starts to brown, and there is liquid fat in the wok, then add the pork tenderloin cubes. Sear together until the meat is browned from all sides. 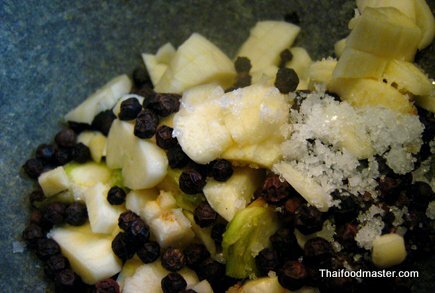 In a mortar and pestle, pound the coriander roots, the garlic and the peppercorns with a teaspoon of salt as an abrasive. The paste does not need to be very fine. Set aside. 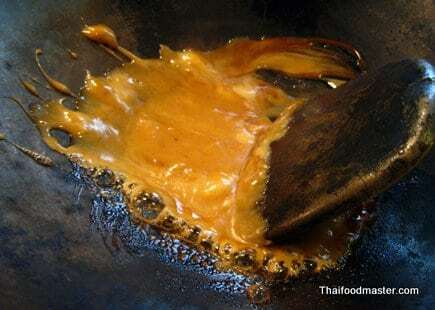 In a wok on a low heat, melt the palm sugar. Slowly caramelize it to a deep amber color, being careful not to burn it! 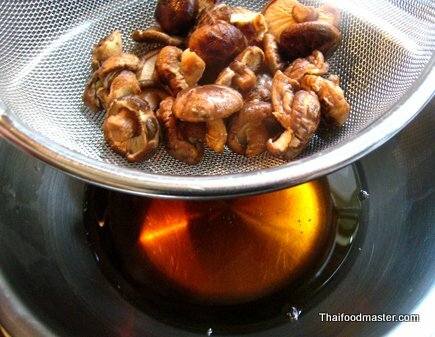 You may add a tablespoon of water here and there, to control the rate of caramelization. Now the sugar is nice and brown. Add the garlic-coriander paste, the cinnamon sticks, star anise and the Chinese five-spice powder. Mix well. Add the pork and eggs to the sugar sauce. Mix well. 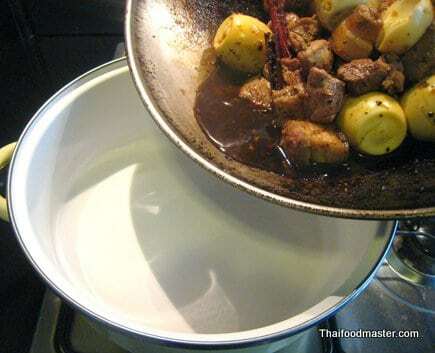 Transfer the pork and eggs to a pot, and cover with a lid. 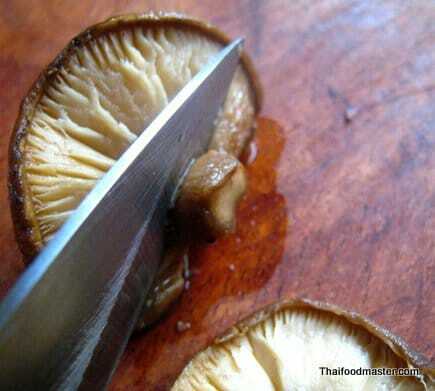 Add the rehydrated mushrooms and their water. Fill the pot with 4 cups of water. 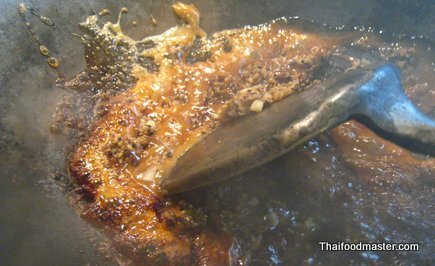 Add the sweet black soy sauce, the fish sauce, the light soy sauce and the oyster sauce. Cover, and simmer on low heat for about 1 hour until the pork is soft and the eggs are a nice deep brown color. Skim any oil that floats to the top. Sorry is coriander root and galangal the same? This will be the first time cookin this kind of one of my favou food, thank u for the recipe. Awesome finally I’ll be able to make it myself. I am out in the country ……. No Lindongski, Coriander and galangal are two different plants. Coriander is a spice. Galangal is in the same family as ginger. 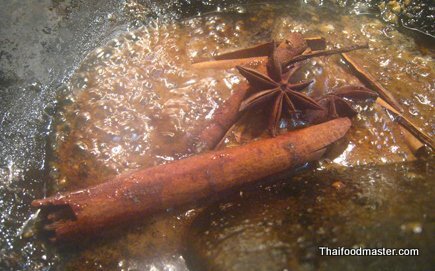 Check them both out each one adds a great flavor to Thai Palo and many other recipes. coriander is the same as cilantro… coriander is the seed of the cilantro. Thank you so much for this recipe. It’s stewing right now as I’m typing. 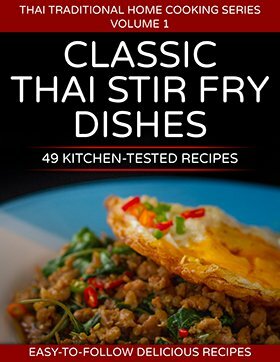 I’ve been looking for an easy to follow recipe for this dish that’s not in Thai but still keeps the authenticity for a while and this recipe is definitely it. It’s great dish for work lunch for the whole week. Not sure if it’ll last the whole week tho… THANK YOU! i have a quick question, is it 4 cups or 8 cups of water? the ingredient said 8, but direction said 4. thanks in advance! Fantastic!! I’ve been looking for this recepie for a long time and finally found it here, thank you very much for sharing! I lived in Thailand for a year and ate street food for breakfast lunch and dinner now really missing it and finding it impossible to find the ‘real thing’ in London. Regretting not writing down the names of everything I ate. Will be using this website a lot!! hi, in receipt says 4 or 8 cups, what kind of cup? how big the cup? I can’t tell you how happy finding this recipe made me. My favourite dish, and it is absolutely perfect! Your photos and instructions are the best I’ve seen on a food blog, made it so easy to make. 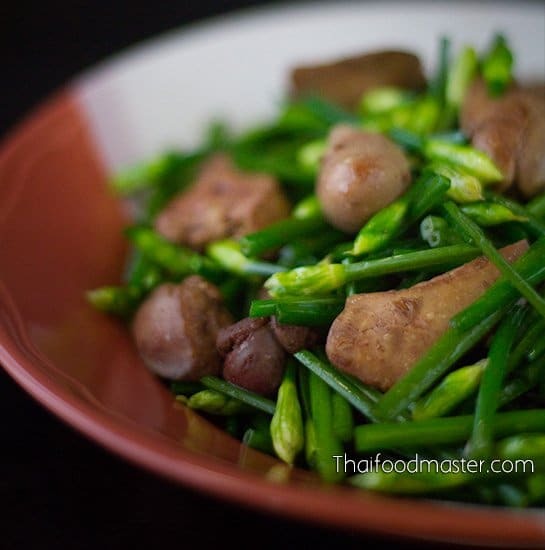 Cooked this as part of a Thai dinner party for a big group of friends – they all loved it. Two thumbs up!! Thank you for the kind comment ! Nice job on the part about how no make this !! !